Earlier in the year I was lucky enough to fly to the Philippines on a media trip. Here’s the first story in a series documenting my experiences there. This feature appeared last weekend in the travel sections of The Age and the Sydney Morning Herald. Lagen markets itself as an eco-sanctuary in El Nido, a cluster of 45 small islets dotted around a private marine park on the northern tip of Palawan, itself part of the 7000-plus archipelago most people know as the Philippines. The area is home to more than 900 species of fish, 100-plus types of birds and an array of invertebrates, mammals and, as we already know, some decent-sized (but harmless) reptiles. These striking, mostly uninhabited James Bond-looking islands jut hundreds of metres out of Bacuit Bay’s deep blue waters, their 250-million-year-old mottled limestone rock walls covered in dense rainforests of strangling figs, ferns, orchids and Manila palms. Boasting countless secluded coves and hidden, sandy beaches, the islands are perfect for exploring, snorkelling, kayaking and romantic picnics. Surprisingly, though, despite recent high profile awards (El Nido’s Nacpan Beach was among TripAdvisor’s 2016 World’s Best Beaches and Palawan was voted World’s Best Island by Travel & Leisure Magazine two years running), there don’t seem to be too many people here. Perhaps it’s because the Philippines has been in the news recently for the wrong reasons, with a terrorist insurgency in the south and a series of controversial police killings of drug suspects elsewhere. 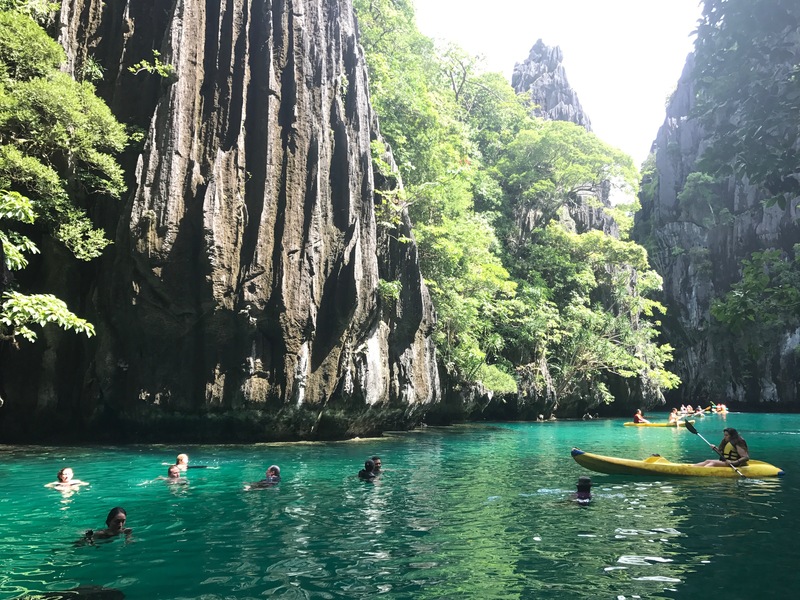 Regardless, El Nido feels and is (in practical terms) a world away from this strife, which means you get all the region’s natural beauty without the queues. 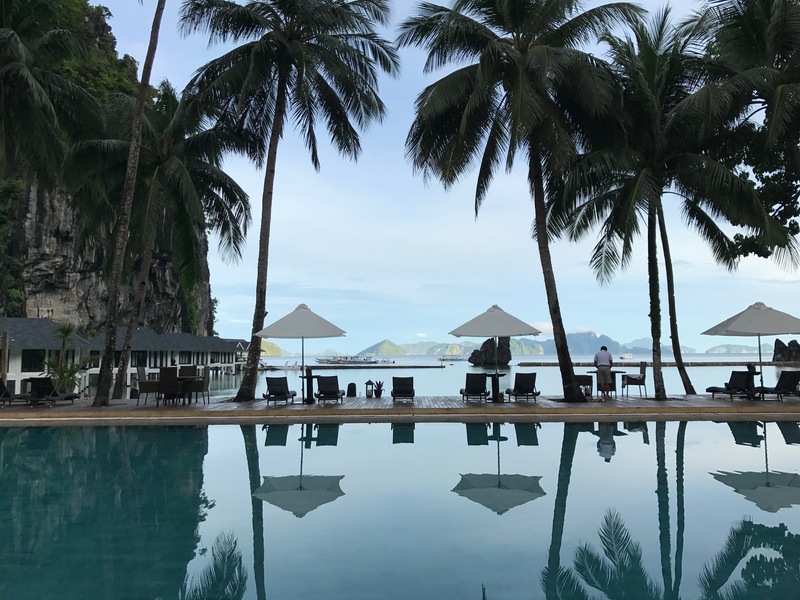 My El Nido experience began with an exciting plane landing over water at Lio Airport, which opened in April 2017 and exclusively services resort guests. The new airstrip is a game-changer, with previous access via a gruelling six-hour car journey from the airport in the City of Puerto Princesa. After a night in El Nido’s rapidly expanding mainland beach resort area (two hotels built and three more in construction) – not to mention beholding one of the most spectacular sunsets and pina coladas I’ve ever seen – we catch a 30-minute boat-ride to our new island digs on Lagen. And what digs. El Nido is owned by the Philippines’ wealthiest family the Ayalas and, with overnight accommodation starting on this island at PHP28,000 ($690), it’s less backpacker, more five-star rich and famous (Lagen’s quirky chapel is a favourite with Filipino movie star brides and Bill Gates once enjoyed lunch at one of its five secluded coves). So, past the swaggering lizard I take a short walk to my water cottage, one of 18 that sit on stilts either side of Lagen’s picturesque, horseshoe-shaped lagoon. Soon after settling in, a tropical deluge descends and I retire to the verandah daybed with nothing better to do than sip a cold San Miguel beer and gaze across the water at the dripping rainforest and cliffs in front of me. Weather like this is not uncommon here in August (dry season is December to May) but these downpours don’t last long. Indeed, after 40 minutes the rain starts to ease and, first with a tentative quack and then a bolder chirp, the animal chorus begins, growing in enthusiasm. 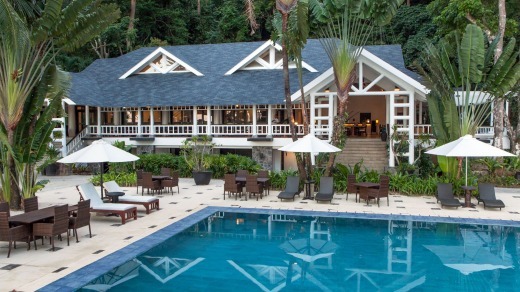 While the resort has a lot going for it – spa, coconut palm-fringed pool, rainforest and mangrove walks, bird-watching and a fun sunset cocktail bar – most of the action is water-based. Stand-up paddle boards, kayaking, fishing, snorkelling and scuba diving are all on offer but we decide to set off early the next day on an island-hopping day trip. Our mode of transport is a comfortable bangka (a double outrigger ”canoe” fitted with an engine), which moves easily over the glassy blue water. There are few other boats to see and no commercial fishing, which has been banned here since 1988, according to our local guide, Arnel. Next stop is Small Lagoon and entry is via a narrow rock crevice with room enough for one kayak at a time. Inside, the lagoon doglegs to the left, ending in a deep green pool surrounded by more cathedral-like limestone walls draped in overhanging trees and dangling vines. “Would you like a swim?” asks Arnel. I wasn’t expecting to have a dip but something primal is drawing me into the water. We park the double-kayak by some Dutch backpackers splashing each other with their paddles and I slip under the cool, refreshing water. I spend eternal minutes floating on my back gazing at the passing clouds above. It’s heavenly. After some coaxing from Arnel (and the prospect of a log-jam at the lagoon exit as more tourists arrive) we paddle back to our bangka and head to a reef close to the resort on Miniloc Island. I’m curious to see how the Philippines stacks up with underwater worlds I’ve seen in Vanuatu and Fiji – I’m not disappointed. The reef is teeming with marine life: red-and-white-striped false clown anemone fish dart in and out of cover; sensing movement, blue-lipped giant clams snap shut; and vast table corals serve as cleaning stations for busy pilot wrasse, who pick the scales of larger fish clean like underwater pit crews. By the time it’s lunch we’ve already spotted a sea turtle, a moray eel and swam exhilaratingly close to a school of metre-long, jet-black jack fish. 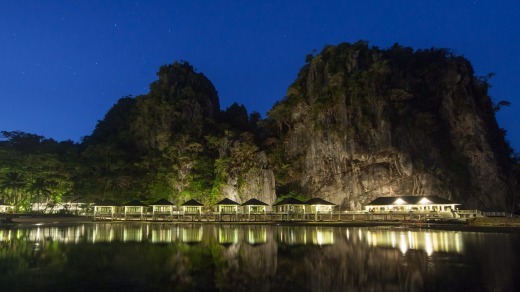 If you like nature and exotic wildlife El Nido won’t disappoint. At the end of my stay I tally up my animal checklist. I’ve spotted (or heard, in the case of a particularly noisy but well-hidden rainforest squirrel) 12 of 25 listed animals, including a couple of long-tailed macaques, a flock of Palawan hornbills and a soaring, white bellied sea eagle. It’s almost a pass – but I know I could do better when I return, one day. Better known as Snake Island (thanks to the curve of its beach rather than its fauna), this uninhabited dot of land is a popular spot for swimming and taking in views of the bay. With two breathtakingly beautiful lagoons (modestly named Big and Small) and excellent shallow reef snorkelling, this is a favourite island for families and divers, with two dive sites only 15 to 20 minutes away. Long-tailed macaques, Palawan squirrels and the famous Palawan hornbill are just a few animals you can spot on this rainforest island eco-sanctuary. Lazy local water monitor lizards are also a feature. Accessible only at low tide, this cave is tucked away on the Palawan mainland not far from Lagen Island. Clamber through a narrow hole and you’ll find two chambers, and yarns from locals about ancient human burials. The jungle-topped limestone islands in Bacuit Bay provide tranquil lagoons perfect for kayaking and swimming, excellent reefs for snorkelling and diving and plenty of secluded beaches for romantic picnics. Boat tours can be arranged through El Nido Resorts. Phone +63 2 813 000. See elnidoresorts.com. Philippine Airlines (PAL) operates direct flights to Manila on newly configured tri-class A330s from Sydney (daily) and Melbourne (three times per week), and via Darwin from Brisbane. Flight time is about eight hours. AirSWIFT is the only airline that flies direct to El Nido from Manila or Cebu. See philippineairlines.com and air-swift.com. Travellers can choose from four island resorts in El Nido: Apulit (adventure), Miniloc (families), Lagen (eco-sanctuary) and Pangulasian (luxury). See elnidoresorts.com. On Lagen, rooms start from PHP28,000. Most popular rooms are Water Cottages, which start at PHP32,000. See elnidoresorts.com/lagen-island. Peter Barrett travelled as a guest of Philippine Airlines and the Philippine Department of Tourism. This story was first published on traveller.com.au, November 9, 2017.